It may have had the mildest blink-and-you-miss-it facelift, but underneath the skin there have been plenty of revisions to extend not only the range of Nissan’s pure electric car, but also the appeal. I took a quick drive to find out if it’s worked. Dealing with the visible changes won’t take long. 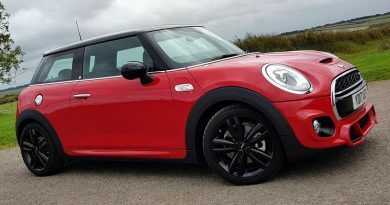 Given half an hour or so, you may spot that the low front grille has been tidied up, but I imagine you’ll miss the new wheels and subtly altered wing mirrors. For the outside, that’s it. On the inside there have been a few more minor changes, the most noticeable of which is the dark trimmed interior. The old light colours looked bright and airy but were perhaps not ideally suited to a family car, so dark grey and black takes over. 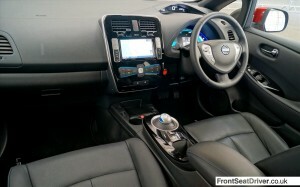 The front seats have also been revised, giving rear seat passengers an extra 5 cm of legroom, while the boot grows significantly now that Nissan have moved the charging unit out of the way. Arguably more important to buyers is the fact that there are now three trim levels rather than the one-size-fits-all trim level forced upon early buyers. That has the added bonus that the starting price has dropped again, with the base level Visia starting at £20,990. You can also now follow Renault’s lead and lease the batteries from Nissan. This knocks a further £5,000 off the price, but means you’ll be paying £70 a month for the batteries. However, taking the Visia option means you miss out on some of the new tech that separates the face lifted LEAF from the outgoing model. While all the new models get a revised electric motor, only the more expensive Acenta and Tekna levels get an enhanced regenerative braking system or the impressive new air-conditioning system. This uses 70% less energy than the old system, making a significant difference to real-world range. The Visia also misses out on the Carwings smart phone app that allows you to control certain systems on your LEAF. This allows you to check on lots of data, such as the driving range left while you’re inside checking Google Maps, or even turn on the heating or air-conditioning before you get to the vehicle. The Tekna trim level also benefits from an energy efficient Bose sound system. Combined with a near-silent driving experience, this makes even One Direction sound palatable. 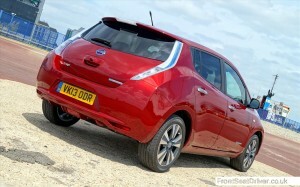 The driving experience will be familiar to all electric car drivers. Instant torque combined with a distinct lack of noise from under the bonnet means you can be at the mercy of urban speed cameras far sooner than you might expect. Braking also takes a little getting used to as the car recovers as it slows down, changing the brake feel as the speed drops off. However, once you get the hang of these foibles you’ll find the pure electric experience to be incredibly easy and relaxing. That holds true for the LEAF, which darts off the line with a brisk readiness while insulating you from the world outside. There might be a fair chunk of body roll when cornering hard but this is an eco car, not a sports car, so that can be forgiven. Ride quality is also generally good, despite the Japanese firm tuning the chassis to more European tastes. Only the deepest, sharpest potholes interfere with the calm serenity inside. Is it time to go electric yet? Maybe. I’ll be having a Leaf for a full and thorough test later in the year to find out. Nice post, Nissan is famous in making of good small cars, in handeling its very cool, easily whiped. 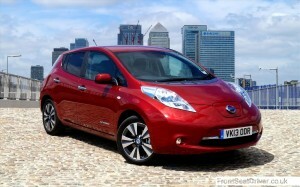 one property of nissan is this in small cars they put powerfull engines. the pickup of nissan cars is good.